Usually spotted outside of popular supermarket chains, coffee houses, and bookshops, chalk menus have sparked the chalkboard artist's recent rise in popularity. 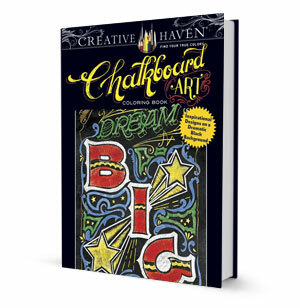 In this latest edition to Dover's Creative Haven series for the experienced colorist, thirty-one ready-to-color illustrations feature the hand-drawn lettering and carefully rendered illustrations reminiscent of chalkboard art around the world. The detailed illustrations are perfect for experimentation with color technique, and the perforated, unbacked pages make displaying your finished work easy.